Screening units are so useful, at taking the bullet for more valuable units. I'd always sacrifice my 120pt unit of clanrats, to keep my heros from being charged. Honestly, I think you should just stick with one army. That's what I'm doing with the Skaven. You'll get a lot better at the game if you don't switch factions, and helps save money ha ha. Your Deepkin are looking great! I think the GW cases Would work great for transporting them, as those cases have flexibility channels for your models. I use Harlequins skyweavers, which are similar in shape to the eels, and they fit perfectly. That undead list was way too top heavy. Investing all those points in characters is putting far too many eggs in one basket and it diesn't pay off at all against your army. Your opponent needed a lot more Grave Guard in my opinion and Black Knights are, in my experience, not that good, which is a shame. Congratulations on your victory. You exploited the weaknesses in your opponent's list very well. The mortarchs all come in the getting started boxes, which is why he had them. More skeletons would be ideal, as they are one of the most dangerous units that book has. I don't mind black Knights. They are not terribly expensive, and are a nice little speedy skirmisher. Certainly you want them to get the charge. They are a great unit to resurrect with the gravesites. Black Knights don't have enough punch for me. They are supposed to be heavy cavalry, but they play more like skirmish cavalry or, at best, light cavalry. They're more like the old Skeleton Horsemen used to be, which would be okay if that's how they were supposed to work, but they're not. I hadn't realised that he had constructed his army out of so many starter sets. That does explain the rather strange nature of the list. He clearly has a decision to make about which Mortarch to build his army around. Black Knights are light Calvary. If you want heavy hitting Calvary, you want Blood Knights, those guys are deadly. The black Knights are faster than most death stuff, so can hopefully pick fights with support units, artillery, and lone support characters. Plus, they can make early grabs on objectives. You don't really care if they die, as you can just bring them back. Death has three starter boxes, all of which are a great show value. My buddy bought two of them, and the Christmas army bundle (the store had one in stock still). A 2000pts+ army for $400 is pretty good. In terms of the rules, Black Knights have been turned into light cavalry in terms of how they function, but in terms of the lore and the models they are anything but. They are heavily armoured mounted Grave Guard. As such, to be consistent with the lore and the design of the unit, they should actually function as heavy cavalry. GW has, for the most part, done a very good job with transferring Vampire Counts units from Fantasy to Age of Sigmar, but this is one unit where the transition went awry. Blood Knights certainly are heavy cavalry in all senses of the term. I'm just waiting for them to produce new models for them. They'll be the core of my Soulblight army if I ever get to build it and/or play it. Who knows, if you ever get back over here, I might have a Soulblight army to use against your Skaven, but you'll have get the timing right . I was never interested in fantasy before Age of Sigmar, but Black Knights are not Graveguard on horseback in AoS, they are pretty much just skeleton horsemen in the lore. But, they are good on the charge. If you use a wight king's command ability to give them all +1 attack, and then use a Necromancer to let them attack twice, they'll (effectively) get 6 Damage 2 attacks each. Not bad for a unit which is 120pts for 5, and come back to life for free by spending a command point. A lot of stuff in dead is fairly mediocre for the points, but you have loads of ways of buffing units, and part of the cost factors in that they don't stay dead. If you're not charging, their damage output drops a lot. I'd probably use them in units of 10 at least, to get better value from spell/command ability buffs, and better value for re-summoning them. I've seen a lot of really good blood knight conversions using Dragon Nobles from the Aelf range. But, yeah, they are a costly unit $ wise. I do want to visit the renovated Warhammer World, but I have no idea when I'll be able to make it out there again. I wish I lived there though, for all the gaming going on there. My Rats are always happy to fight dead-things. Not much Aos, But I did attend a Warhammer Underworlds tourniment on the weekend. 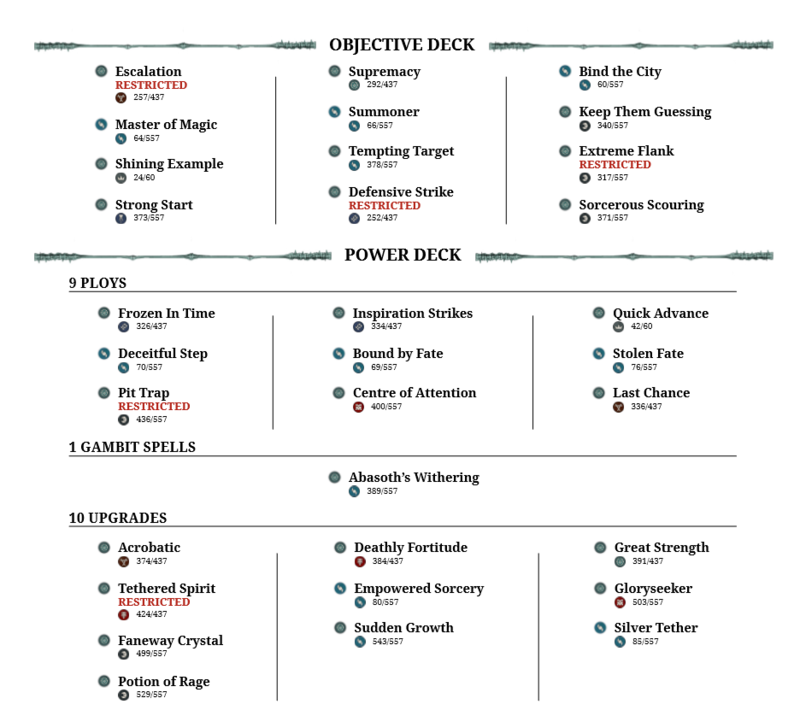 I've been working on playing the new Eyes of the Nine Warband, and have been fine tuning my decks. It wasn't a shadeglass tourniment, but good practice. I ended up winning the event, the only player going undefeated. I played agaisnt the Ironskull's Boyz, Chosen Axes, and Stormsire's Cursebreakers. The fellow playing the Cursebreakers drove in from out of town, and was my toughest match-up. I ended up winning 2/3 games, and it was a close thing too. The first round was decided by Vortemis and Averon Stormsire having a magic duel in the middle of the table. Stormsire having a bunch of regeneration upgrades on him, while Vortemis had a couple of upgrades (which combined), gave him +4 health, but -4 move, so he became a turret lol. In the second game I won, K'charik just went ham, and killed the whole stormcast warband on his own, it was spectacular. Those were the only kills he claimed the whole event. Chosen axes were a tough opponent as well. They are slow, but have high damage and health, so it's really tough! Overall, a fantastic day! I am really enjoying playing Warhammer Underworlds. Those are some gorgeous-looking Eyes of the Nine, I think K'charik is my favorite out of all of them, but well done on the whole team. Also, glad to see more Shadespire, I've been trying to watch more games of it on youtube, and it looks like something I could convince a friend or two to start playing. Congrats on your win, glad you're honing your skills with the Tzeentchians! Warhammer Underworlds is probably my favourite GW game these days. I'm busy painting up all my warbands, and I'm excited to see the models for the new bands when they come out! I love the Warband! Amazing paint job! How is Underworlds? I've heard such good things! It's currently my favourite Game. It's such a well balanced game, you can do well with all factions, I think they are all equal in power. The game is very strategic, and the deck building is crucial and a lot of fun too. You win or lose based on how you manage activations, and build your decks, not on which faction you play. I've won tournaments with three separate warbands so far. Adding this game to the Christmas list. It's great. Warbands are small, so it's easy to paint the whole band up, and spend extra time on painting them. The game is also fairly cheap to collect, as the core box isn't terribly expensive, and each warband box is cheap too. I eventually plan on collecting all the warbands, mostly because I want to collect all the cards lol and I'm a completest, but there is no need to do that. If you do want to play competitively, then you'll probably want to pick up a few extra expansions, just for a more diverse collection of universal cards. Each warband has a very different feel to them, so if the game feels stale, just play a new warband. I played farstriders for a while, and now I'm bouncing between Magores Fiends, and Eyes of the Nine. Been having some more gaming recently. Been trying a new Skyre list, with the learnings I made from the three tournaments I went to. Just finished painting the miniatures to fulfil the list. So, I dropped the Battalion (200+ points not spent on models, was pretty rough). I also dropped one of the Warlocks. Although having four heros (who are wizards), I value having more other units instead. I added three more weapon teams, as I wanted to make the most use of the generals 'Overlords of Destruction' Trait. I changed the Endless spells for just the Geminids. They fill two rolls. Debuffing enemy units, and dealing mortal wounds. If I don't win the initiative roll for the battle round, they give me the opportunity to take advantage of that. I did make sure to spend the points for an extra command point, so I had one turn 1 for a battleshock test (if need be). I think folks are underestimating the value of shooting in AoS, so I plan to take advantage of that. Played agaisnt Legions of Nagash again, same fellow as before. I hoped he'd learn from some of the advice I gave him. He didn't really change his list too much, as he's not had the chance to build up more infantry to replace one, or more, of the mortarchs. We played Better Part of Valour. Needless to say, he played extreamly castiously. He should have rushed the Mortarchs, and Morgast at me ASAP to overlord target priority. Instead, he held back, and came at me peicemeal, which meant he was easly picked apart by my firepower. Arkhan the Black managed to get off Curse of Years, which killed my whole 18 wound Stormfiend unit, with one spell, which was prettyu brutal, but by that point I had burned one of his objectives, and was set up to burn a second objective of his, which would win me the game. After the game, I talked through the game with him. He expressed his fear of my cannons, and I said that the best way he had to win was just rush me. I couldn't win agaisnt him in melee. He also fled in terror of the Geminids, which was a huge over-reaction, especially as Death doesn't care about mortal wounds. Also, I've been playing heaps of Warhammer Underworlds. Played a few games with the Magores Fiends (I picked up the warband for the cards, but figured I've play a few games). They are a fun warband, but don't suit my personal interests. I do like the mechanics of Riptooth, but I prefer more tricky warbands, which is why I am focusing on Eyes of the Nine, and Garracks Reavers. Yes, Death armies need to get into close combat en masse to achieve the necessary damage to break through an opposing armies battle line. Also, I think that he needs to play more in character with his army, i.e. why would the undead be scared of anything? Use some magic to soften up a unit or two on the way in, but commit and strike early. I think that some kind of refused flank strategy might work well for him, although greater numbers of infantry for the central battle line might be needed. As an aside, I always loved Curse of Years in Warhammer. I'm glad to see that it still has the potential to wreak havoc. Yeah, he just needed to play agressive. I could probably kill one, or two of his scary units a turn, but if he rushed me, I'd have only a turn to do so. By holding back, he gave my weapons the time to do their dirty work. He does need to drop some of the expensive characters for more skeletons. But, I can understand his reservation to do so. Buying skeletons just doesn't seem as much of an exciting thing to buy. For curse of years, it's a pretty gross spell. If your opponent has no magic, or mortal wound defense, it can kill a unit of infinite size, or any character or monster after rolling dice six times. It's a bit gross. That, and Nagash's Hand of Dust spell, are two of the most obnoxious and friend-killing spells in the game lol. Just kills things, and there is nothing you can do about it. I really like the look of Underworlds. Thanks for sharing! My understanding of Age of Sigmar is that characters are not like they used to be in Warhammer in terms of power or durability, especially for Death, so he just needs to accept the fact that he needs more infantry. My Death force started off with too many expensive characters and it didn't work, thus experience has taught me that it's not the best approach to building an army. It's similar to how it used to work in Warhammer. It was always a tough spell to actually cast, but if you were successful and your opponent was unable to dispel it, the damage it would cause against mass infantry blocks in particular was horrendous. Hand of Dust was more of a character killer, but still very powerful if used correctly. Either way, I'm glad that they have kept some of these iconic spells. Today I brought my Eyes of the Nine out in a Warhammer Underworlds Tournament. Round 2, 2, was against the Skaven! It was a fellow who've I've played often before. Game 1, went well for me, with K'charik and Vortemis just blasting stuff, and I scored a lot of glory with my passive objectives. Game 2, He killed Vortemis quickly, which stopped a lot of my warbands power. Game 3, was kind of hilarious. Skretch (is the greatest yes-yes), and Vortimis just slapped eachother for a whole action phase, until K'charik came in and sliced the skaven general in two. I won two, lost 1. I earned 21 glory out of the first two games, while my opponent earned 16. Going into round 3, there was three players with two wins (me, an Orruk player, and a second cursebreaker warband). The other cursebreaker player and I were almost tied on glory (I think I had one more), so it'll be close to decide overall winner. I was paired with the Oruck player. Round 3, I won the deployment roll, so I deployed the boards in a long corridor, with my warband stuck at one end. My blue horror I popped into his deployment zone, which distracted him into attacking it for the first action phase. Due to this, his models were never able to reach mine for the next two rounds, while I used the blue horror to help me score supremacy, and Bind the City, while I denied him scoring objectives due to stayng out of his charge range. At the end of the third round, the only fighter which died was my blue horror, which I re-spawned. Ended 12-1. Needless to say, he didn't really enjoy that game, and gave me some really snide remarks afterwards. Sorry I guess, for trying to win the tourniment. At the end of the event, the other Cursebreaker player and I went undefeated, but I had 61 total glory, to his 58, winning me the event! Earning me my second shardglass trophy! And here is the decklist I used.